The Food Pantry collects and distributes food bags to those in our area who are food insecure. The pantry, a joint mission project supported by the Knightdale Alliance of Churches, is housed at Knightdale UMC. Unlike other area food banks, we operate on an honor system - no paperwork is required to demonstrate proof of need. More than 9% of the population of East Wake County lives at or below the poverty line? Over 31% of children in East Wake County live in poverty? Our Food Pantry serves about 60 families per week? We also partnered with local schools to provide food for about 40 children on weekends? Suggestions? Comments? Want to volunteer? 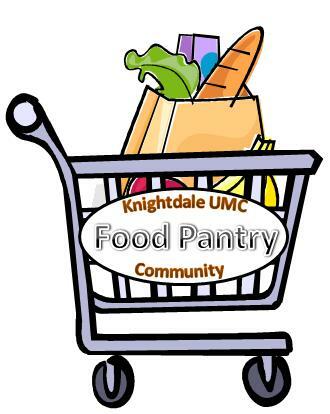 Contact Brenda Wester, Food Pantry Director, through the church office at 919-266-2373 or kumc1@bellsouth.net .